With less than a week remaining until the curtain is drawn on “UFC on FX: Guillard vs. Miller,” a couple of last-minute scratches have changed the card’s preliminary roster. The light heavyweight bout between former MFC champion Ryan Jimmo and Karlos Vemola has been nixed from the January 20th lineup. According to the world’s premier mixed martial arts promotion, an undisclosed injury forced Jimmo to pull out of the fight. Instead of trying to locate a replacement, Octagon officials have decided to scrap the 205-pound affair altogether. In addition, Reza Madadi withdrew from his lightweight contest against Fabricio Camoes for an unknown reason. The UFC will be looking to find a substitute to face Camoes. The event takes place inside Bridgestone Arena in Nashville, Tennessee. FX will air the main card live starting at 9PM ET/6PM PT. 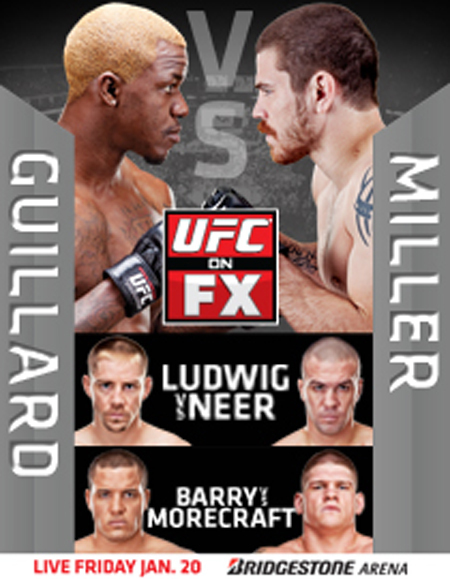 Lightweights Melvin Guillard and Jim Miller headline the festivities.